RandomPottins: Not yet the last post! AS Lib Dems and Tories combine in plans to privatise Royal Mail, post office workers like others are preparing for a fight to defend two important parts of our real 'national heritage' - the ideal of public service, and the institution of free, representative trade unions. 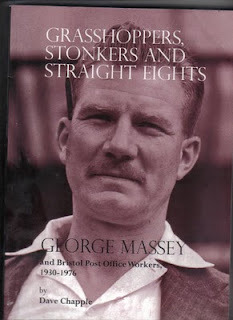 Dave Chapple's book Grasshoppers, Stonkers and Straight Eights, George Massey and Bristol Post Office Workers 1930-1976, taking its title from post workers' slang, is a tribute by one union activist to another. George Massey, son of a postman and union activist, started as a boy messenger in Easton, Bristol, where he grew up, and spent the remaining 46 years in the Post Office, apart from his wartime army service. In 1958 he was elected to the executive council of the Union of Post Workers (UPW), which grew into today's Union of Communication Workers(UCW). 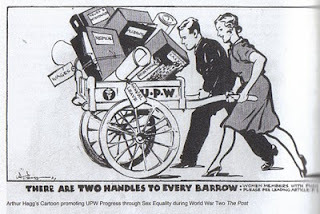 Dave says he was first led to the idea when clearing some old cupboards at the UCW's Bristol offices, and if like me you can seldom get through such jobs without pausing to look at some fascinating old magazines or pictures then you will share the delight at Dave's cornucopia of photographs, cartoons from the Post , the union's magazine, and sundry clippings of news, advertisements and pamphlets. Not content with a scrapbook, Dave went to see George Massey, and found the veteran full of life, not just memories of Bristol working class life in bygone years, but the same passion for justice that had inspired him as a lad. George may walk with sticks nowadays, but as he told Dave, "Remember, I'm no armchair Marxist!" This is no mere trade unionists' version of coffee table nostalgia, though its 240 pages of A4 make it big enough. It graphically reminds us of real struggles, and some of these at least aren't yet over. 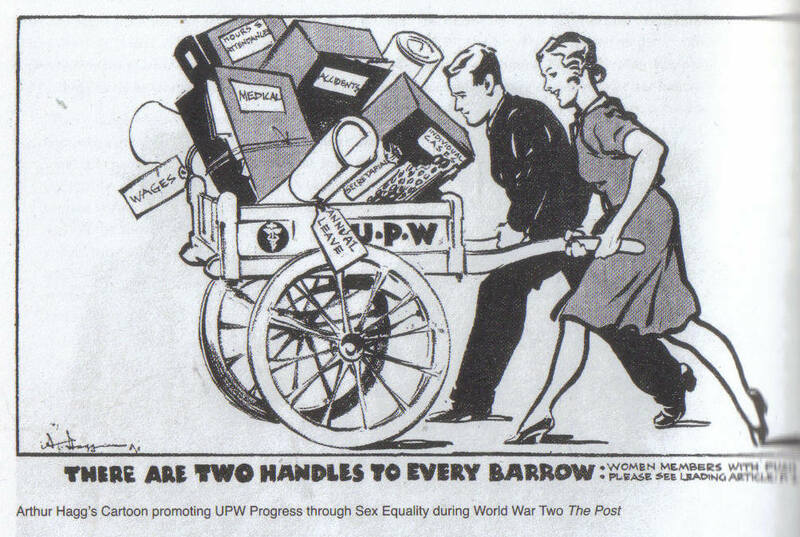 Arthur Hagg's picture of a woman and man pushing the UPW barrow together must not have convinced some of my Dad's colleagues in Newton Street sorting office in Manchester, for they were still arguing against equal pay, fearing it would encourage more women to come and take men's jobs, up into the 1950s. "But if the GPO has to pay them the same money, it can't use them as cheap labour," I said, in my innocent childish logic. Of course, Society decreed that man must be the breadwinner, provide a telly, and aspire to a motor car, while women were supposedly light of care and looking for marriage. But attitudes change, and by the 1960s even the more conservative blokes will have realised their daughters, if not wives, could earn more as a typist. No longer content with having to take all the overtime they could get to earn a living wage, or telling themselves it was worth it for the pension, post office workers began thinking about their strength. The photo on the rear of this book shows a mass meeting during the 1971 national post strike, at the front women telephonists, and their poster angrily asking "Scabs, will you refuse the rise?" 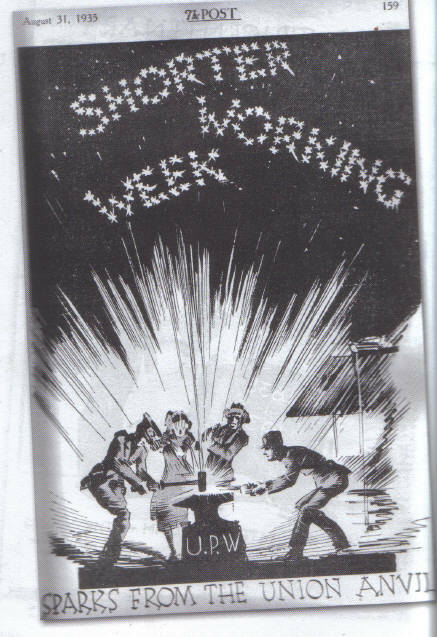 Not that there were many scabs, I think, though I did hear of some workers near retirement being authorised by the union to go into work, knowing that in fact there would be little for them to do, with no letters to sort, but this way they would not lose their pensions. In Lancaster, something else happened. Some striking post workers were running a special delivery service taking pension and benefits cheques to people in the area who might have problems otherwise. Post office management intervened, taking away the delivery van. Long part of the civil service, post office workers could also consider themselves serving the public - often in direct contact, whether over the counter, delivering mail, or putting someone's call through. Since they were a Crown service, they did not have to argue as other workers did, for nationalisation. Instead, their union was perhaps the only one where Guild Socialism, that quaintly English form of syndicalism, gained lasting influence. It could mean a tendency to corporatism, but it could and did also lead to demands for workers management and control. A photograph at the beginning of this book shows Bristol UPW members, men and women, with placards saying "Equal Pay for Equal Work", "Free Civil Servants from MI5", "Shorter Working week for All", and "Let More Workers Manage Industry". That was on the Bristol Trades and Labour Council's May Day march in 1947. The union went on record for workers control in 1957. Now, the post office has been broken up into bits, British Telecom privatised, the parcels service parcelled out, with private couriers losing sensitive official documents but not, it seems, their contracts. The Con-Dem coalition, following where New Labour tried, wants to sell off Royal Mail, and thinks it can weaken workers' opposition by offering shares. I expect the workers will see through this, and may even come up with their counter plan for all communication services. With his four decades in the post office interrupted only by a wartime stint in Burma, George Massey was involved from boyhood in the long struggle of post office trade unionists. But more than that, George was a communist, seeing the struggle of the whole working class, in Britain and internationally. He was all the better for being not afraid to challenge the party line occasionally. Put out in the 1930s for being unwilling to swallow the Moscow Trials, he did not let this get in the way of opposing Cold War right-wing and its witch-hunts in the 1950s. Dave Chapple, too, does not let his own anarcho-syndicalist views obstruct the respect and warm sympathy he has for a fellow-working class fighter, and for those who have gone before us. He does not try to make his subjects fit his own picture, but lets them do the talking, bringing out their views and experience, before, as in this book, modestly offering some 'Final Thoughts'. This is the second book of its kind he has produced, his first having been Henry Suss and the Jewish working class of Manchester and Salford . In between, he has paid tribute to hospital worker and Spanish civil war veteran Howard Andrews, and written about past struggles in his hometown, Bridgwater, besides finding time to be a post worker and branch secretary, and chair the National Shop Stewards Network . The link between generations is made explicit by an opening "Tribute to the Rosa Luxemburg Group of Sorting Clerks and Telegraphists", a group to which young George Massey belonged, with quotes from the Bristol Rank and File Committee minute book, explaining that "The new Rank and File movement of the UPW is being inaugurated with the object of rejuvenating the leadership of the UPW, to counteract the pronounced tendency of sectarianism and bureaucracy , and to rally the defeatist attitude of the Staff into a militant and progressive trade union movement". 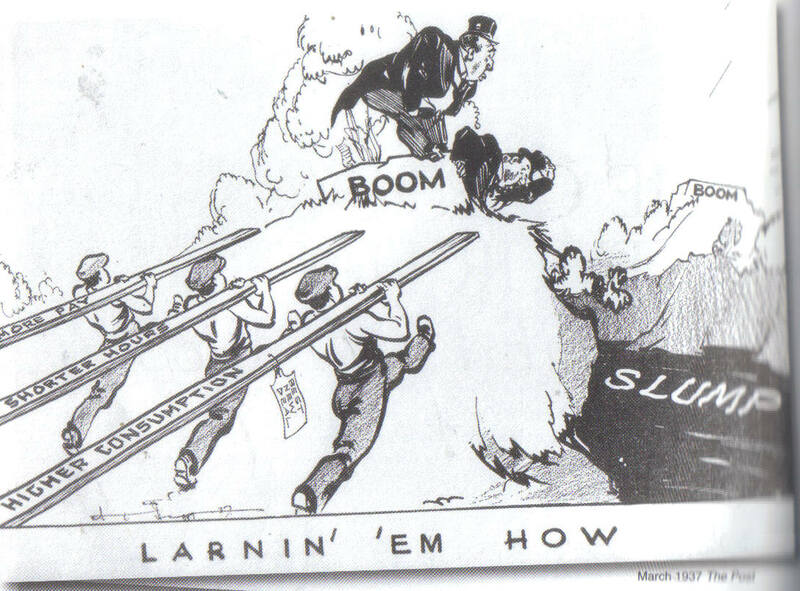 That was in September 1935.